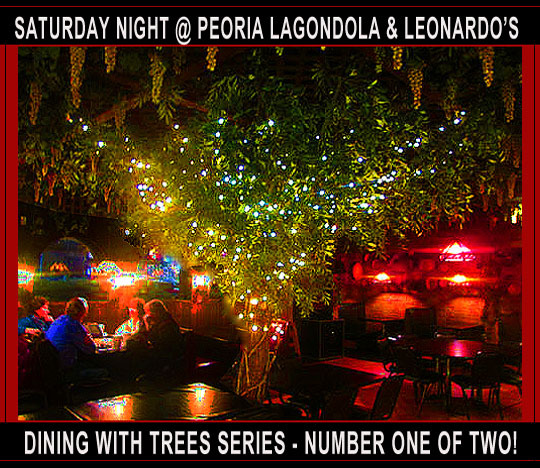 Saturday Night @ Peoria LaGondola & Leonardo’s - Dining With Trees Series: Number One Of Two! Live, from Peoria, Illinois, it’s Saturday Night starring this week’s host, Peoria LaGondola & Leonardo’s with special guest stars, Wylie, John, Lauren and their dining room tree! Now please welcome this week’s host, Peoria LaGondola & Leonardo’s! There’s two restaurants in Peoria that have trees in the middle of their dining rooms. One of them is Peoria LaGondola & Leonardo's Restaurant right here on War Memorial Drive. I thought I’d do a two-part series about dining with trees and this is episode number one with number two to follow tomorrow! So let’s start this series and this Saturday night by walking in the door and ordering tonight’s dinner! Here’s the tree in the center of the dining room! It’s sparkly and quite a centerpiece for this room. It really adds to the unique atmosphere and ambiance in the restaurant and we’ll take a further look around in a little bit. Now it’s time to find a table and wait for dinner to come out. The Hot Sicilian, which I’m guessing was partially inspired by Paris Hilton. This is a half a loaf of their fresh-baked bread topped with their homemade meat sauce and salami and topped with a generous portion of Mozzarella cheese. I added a little hot sauce and pepper on top of all of that. Let’s slice into it to see the ingredients under the cheese. There’s the salami and meat sauce under that thick layer of melted cheese. It’s really a delicious and satisfying dish. It’s listed under the sandwiches on the menu, but it’s almost like a variation on a medium soft crust pizza. Any way you slice it, it’s a tasty dish and I’ll definitely order it again! Now let’s take a little look around in here. I’ve been coming here since it opened up in 1975 and it’s retained the same Italian old-school atmosphere as the decades have drifted by and that’s definitely a good thing. One thing that’s been added is gaming machines which are tucked away in the back right beyond the plant covered archway. I absolutely love the plastic grapes and lights hanging from the ceiling. I’m wondering if they ever change them or if these are the same ones from the ‘70’s? I’ll have to find out on my next visit and it’s a good excuse to come back! Here’s the main dining room which has comfortable leather booths lining the walls. There’s tables in the center, vintage Italian art on the walls and colorful stained-glass lamps hang overhead. Here’s the new item I was talking about in the beginning. It’s a lit up piece of art on the wall opposite the front counter. John told me that a while back a man stopped into the Bloomington LaGondola location and told them that his family used to have a restaurant called, Leonardo’s LaGondola in the suburbs of Chicago and they had this art commissioned back in the ‘70’s. It was in storage for years and he wanted to give it to Peoria LaGondola & Leonardo’s to keep the memory alive. How cool is that? It really livens up this waiting area and adds to the old world charm of the restaurant! 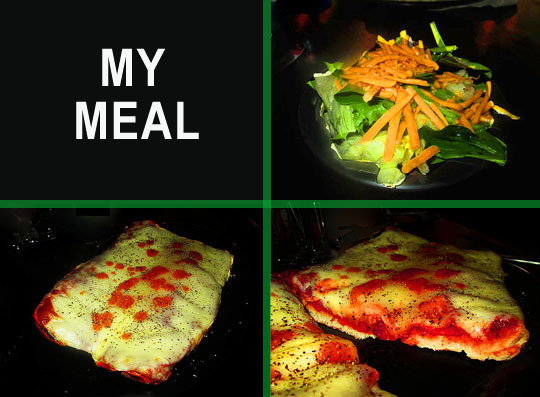 I had a two course meal this week and it started off with a salad that was fairly simple, but very fresh and the Italian dressing was tasty and a nice starter for the mammoth “sandwich” that came after I finished the salad off. As I said earlier, to call the Hot Sicilian a sandwich is like calling the Eiffel Tower a building. 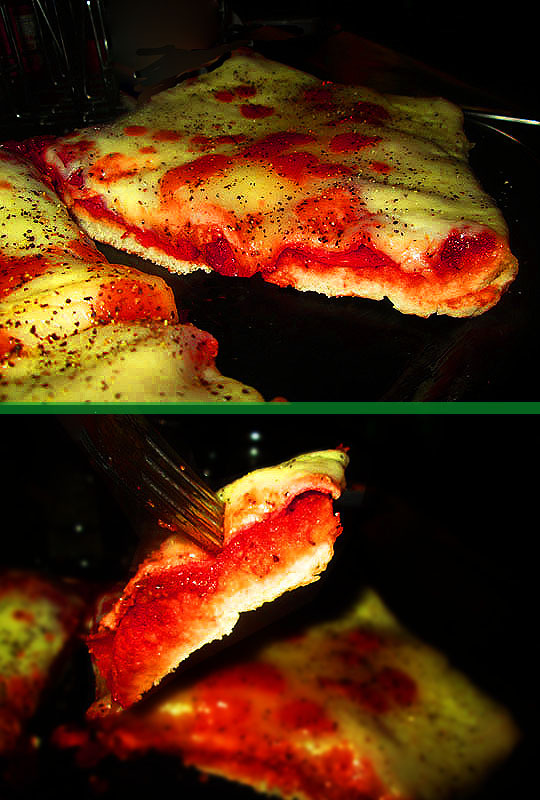 It’s more like a variation of a pizza with their freshly baked bread being the crust. The bread serves as the foundation for their homemade meat sauce, salami slices and a generous layer of Mozzarella cheese that’s baked and served up hot and oh so delicious! It’s a large portion, very tasty and two could easily split the dish. Three and a half Galloping Gourmets—If you’re hungry for pizza, but want a little variation, the Hot Sicilian would be a nice, tasty selection. But if you want pizza, this is one of the few places in Peoria that offers up both thin crust and deep dish pizza in a true old-world Italian restaurant. The tree is definitely unique and adds so much to the warm and inviting atmosphere of the main dining room. It’s sparkly, majestic and a wonderful dining room tree! Four Sonny Bonos—He would’ve been proud to have skied into this gorgeous and sparkly dining room tree! Related Posts: Saturday Night @: The Fish House, The Lariat Steakhouse and Castle’s Patio Inn.